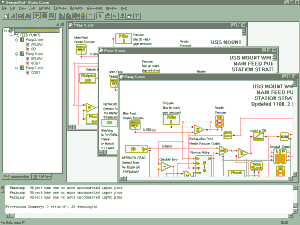 Fairmount Automation’s Design Pad 2000 Professional object-oriented graphical programming environment allows even novice programmers to produce complex programs in a short amount of time. Programming entails “drawing” your desired control scheme using a vast array of operator functions onto a canvas (called a schema — click on the picture for a detailed view.) 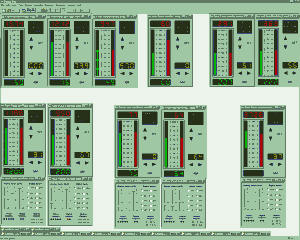 Operators in the schema are then wired together to indicate the signal flows from device inputs to device outputs. It’s that simple. 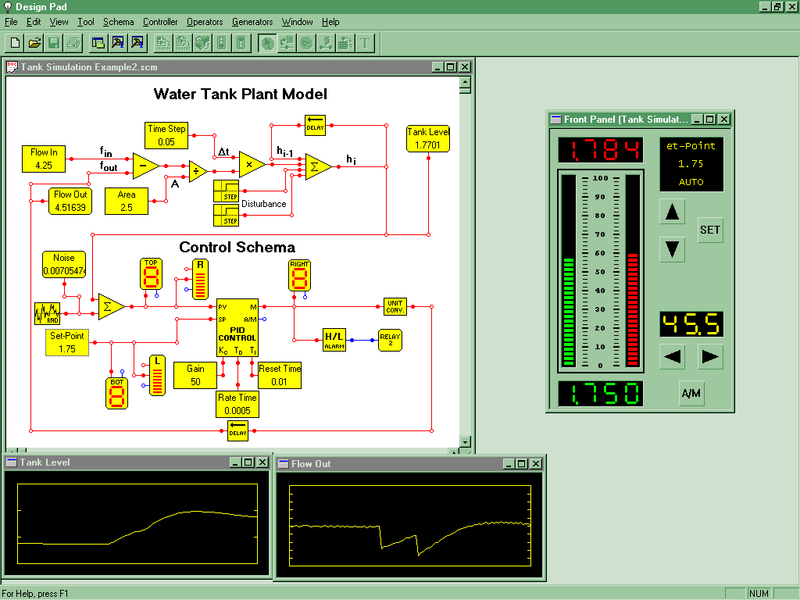 Design Pad incorporates well over 70 operator types for you to choose from when designing a control schema. Operators include Controller Blocks, Signal Conditioning Functions, Signal Comparator Blocks, Mathematical Operators, Logic Functions, General Purpose Blocks, Hardware Operators, and Networking Operators. When you’re done creating your schema, run the internal compiler to check your graphical program for potential problems via warnings and errors. Double-click on the desired compiler output message and Design Pad highlights and centers on the screen exactly what portions of your program are in question. Projects containing several schemas can be grouped together using the workspace feature. A workspace provides easy access to the schemas in a project by displaying them in organized subfolders. If you’re building a project for a controller network, the network workspace view shows what schemas belong to the network and what information each device will broadcast. 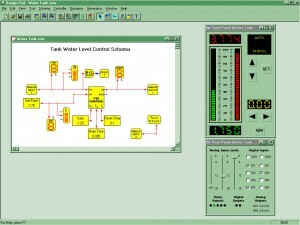 Design Pad incorporates powerful simulation features. You can wire in probes to view how signals respond during a simulation. 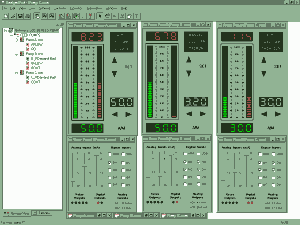 You can view and interact with a computer-generated FAC-2000 front panel to make sure the user interface has the look-and-feel you want. You can graph important signals and view their response over time. 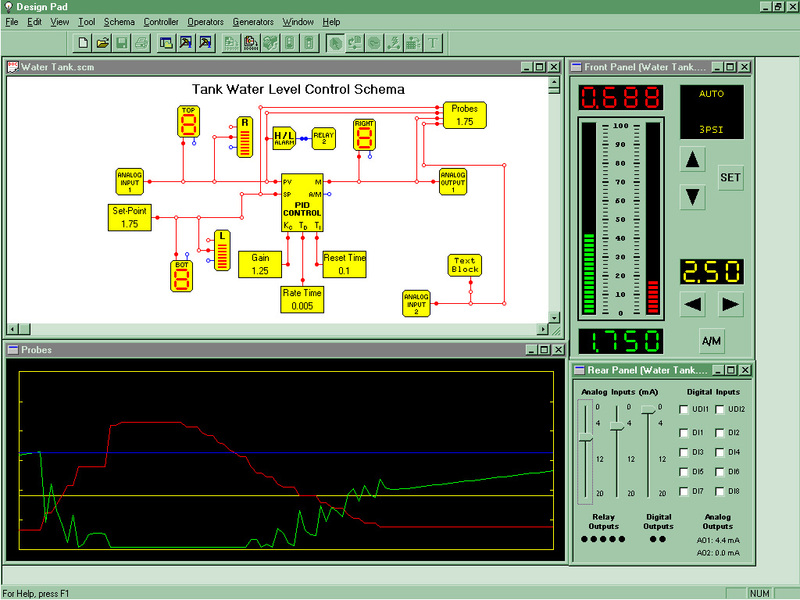 You can even connect your control schemes to a process model and view the response before you try it in the real world — click on the picture to see a detailed view of a simulation. 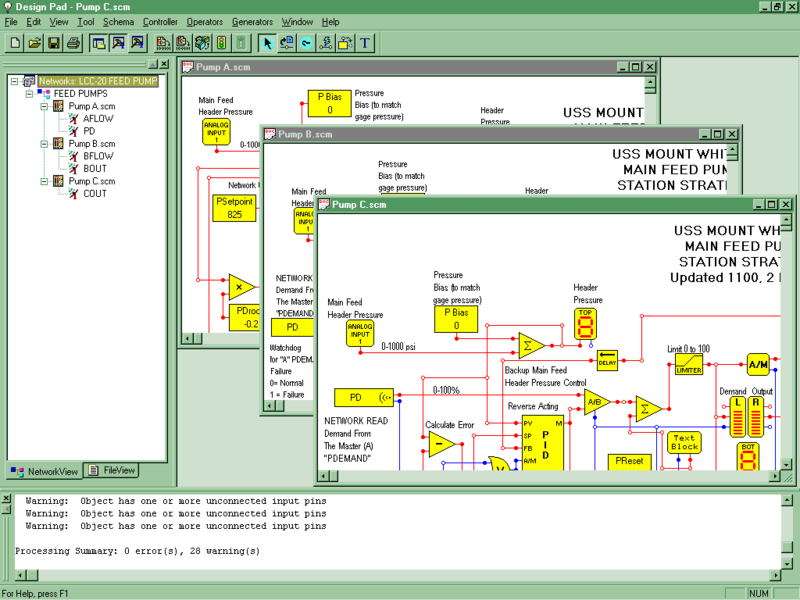 Design Pad can also simulate an entire network of control stations. 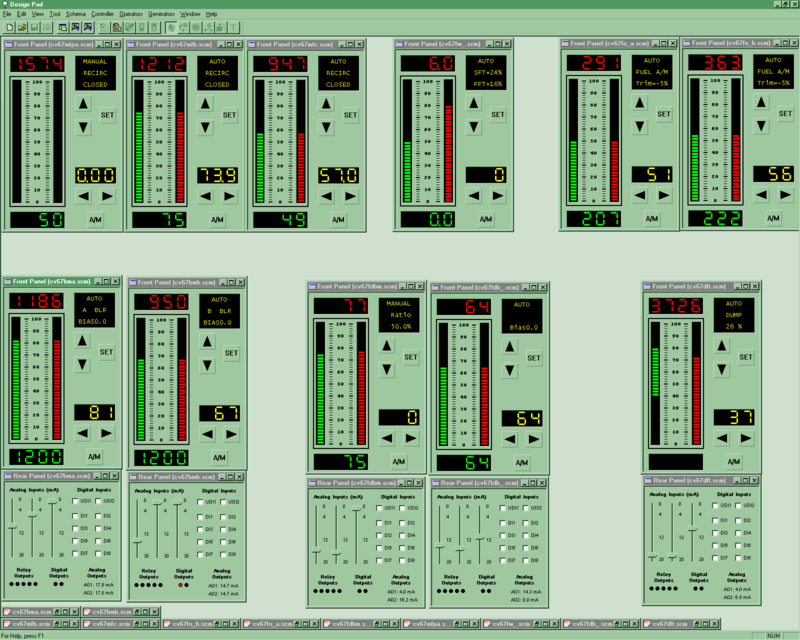 Design Pad simulates the behavior of each control station as well as all the network traffic between the stations. 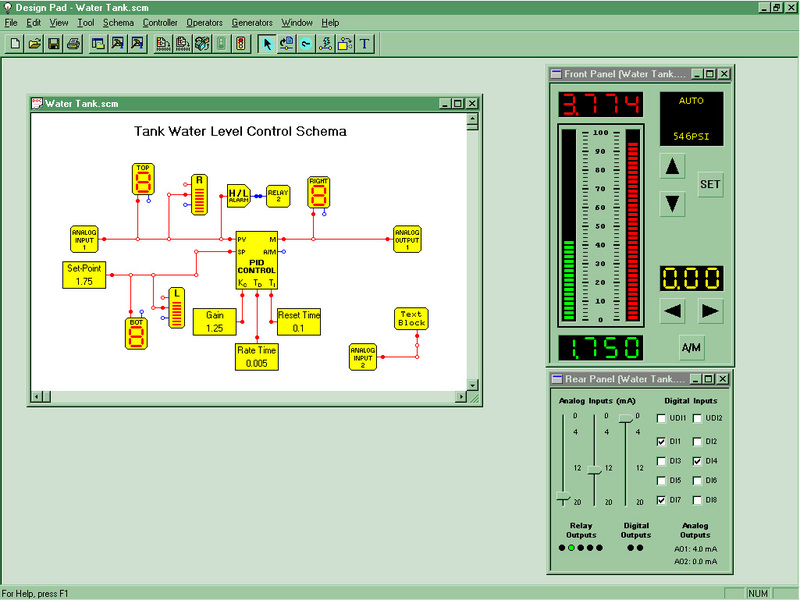 During a simulation, network receivers in one schema receive network broadcast signals from other schemas, behaving just as a real world distributed control system does. Design Pad is equipped with powerful networking features and human-machine interface (HMI) features. The networking features enable hardware-in-the-loop simulations without the need for an OPC server interface (you can link a computer running Design Pad 2000 Professional directly to a FAIRNET network via RS-232 and/or RS-485 ports). Hardware-in-the-loop simulations allow you to run several virtual controllers (with their associated virtual front and rear panels) in concert with several real-world control stations. The virtual controllers behave just like actual controllers, enabling you to bring a process from automatic to manual, change set points, tune multiple controllers at once, and much more. 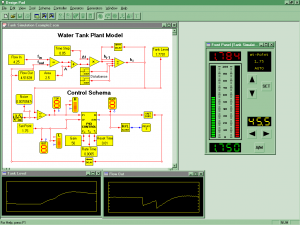 These features are particularly useful when building training simulators, testing large-scale control systems, and deploying remote operator interface (HMI) stations. Design Pad contains enhanced analog and digital debugging probes can graph multiple color-coded signals on a single graph. In addition, the probed information can be streamed to disk for permanent storage and subsequent analysis by programs like Microsoft Excel. Design Pad FAIRNET network connectivity features allow you to capture, plot (strip chart), and stream-to-disk signals broadcasted over the network by remote control stations. 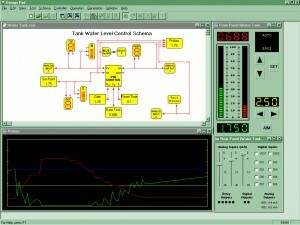 Monitoring and analysis of real-time data from your plant (e.g., graphing system responses to different operating conditions), provides you with important information that can aid you during the design and tuning of your control system. Design Pad also contains a virtual rear-panel to complement the virtual front panel. Using the virtual rear-panel, you can adjust controller input signals and test how the schema responds to varying conditions. 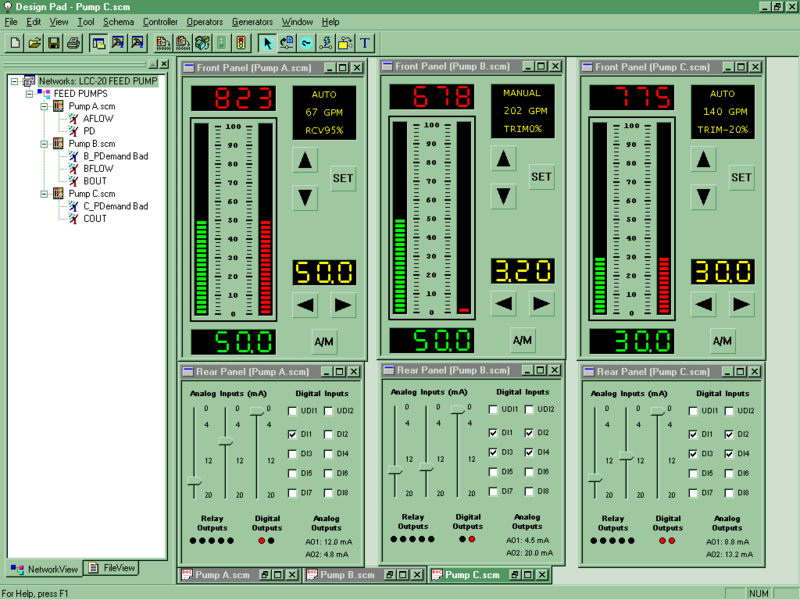 In turn, you can also monitor controller outputs on the rear panel and see how they react under different stimuli.